Monarch butterfly populations have taken a nosedive over the last 20 years, according to researchers who monitor the number of butterflies that spend the winter in Mexico every year. But organizations of citizen scientists in the United States who conduct yearly censuses of monarchs in state parks and other locations in the summer have reported no consistent dip in the number of butterflies they see. John Pleasants, an adjunct assistant professor in the Department Ecology, Evolution and Organismal Biology, said long-term monitoring of butterflies and eggs on milkweed stems during the summer breeding season across the United States didn't note the same decline as that documented in central Mexico, where all monarch butterflies migrate for the winter. "These census findings, which didn't see the same drop in population, cast doubt on the milkweed narrative," Pleasants said. "It made people think maybe the problem isn't with milkweed becoming harder to find. Instead, maybe there's something going wrong as the monarchs migrate to Mexico." "The census takers used to see only a small sliver of the total population," he said. "Now, they're seeing a higher proportion since the monarchs aren't spending time in agricultural fields anymore." 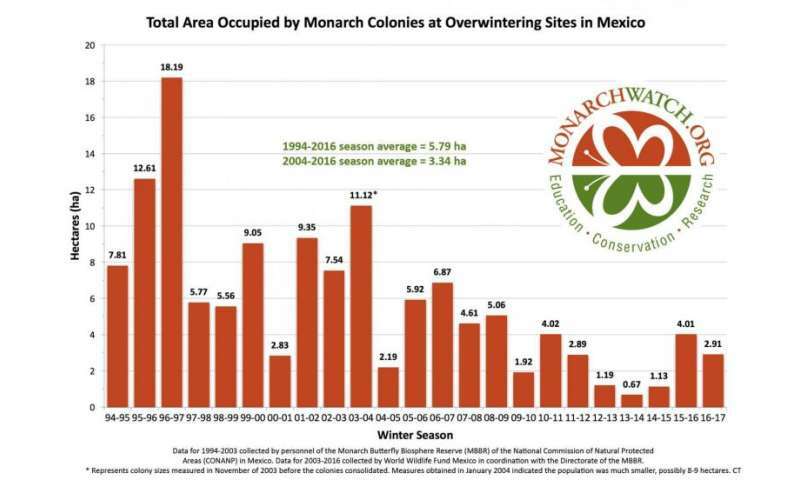 "Then we see with these corrected numbers that, yes, the population of monarchs in the United States is declining at the same rate as the overwintering population," Pleasants said. Pleasants called monarch butterflies an "iconic species," with which virtually all Iowans are familiar. He said the monarch butterfly's distinct appearance and lifecycle, plus its unique migratory behavior, inspire people to undertake conservation efforts to reverse its decline. "It's a fascinating and awe-inspiring bit of biology," he said.